Book a flight + hotel vacation package of three nights or more to Dreams Resorts & Spas, and save up to 55%1 and get $200 in resort coupons2 to enjoy during your stay. Plus, shop for additional deals at select hotels such as children stay free and room upgrades at reduced rates. Ancient ruins park five minutes away. Every Thursday, a street food festival is set up in front of the resort chapel with local vendors. 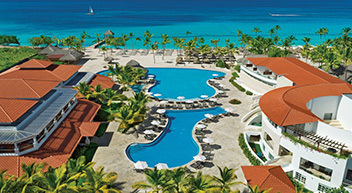 Resort exchange privileges with Secrets Playa Mujeres Golf & Spa Resort (valid for adults-only). Largest free-form pool in the Dominican Republic. Tequila tasting and bicycle city tour available. 2Resort coupons are issued per room, per stay. Resort coupons are issued for limited discounts on select amenities including spa treatments, a romantic dining experience, and wine purchases. Resort coupons cannot be applied toward beauty salon services, spa product purchases, telephone charges, dolphin experiences, gift shop purchases, boutique purchases, internet service (where applicable), marina services, dive shop, medical services, car rentals, or travel agency services. 3Up to two children 12 and under stay free when staying with two paying adults in the same room. 4Room upgrade offer is valid in select room categories. Look for the room upgrade messaging next to your room selection at the time of booking to get this deal.